When it comes to camping tents, sometimes bigger is indeed better. More space makes more comfortable camping trips. This is why many people buy 8 person tents. Eight person tents are the most popular tents for family camping vacations. They provide adequate space for adults and children, as well as luggage. Some of the best eight person tents have dividers so that you can create 2 or more rooms inside the tent. This is great when you want to put the kids in one room, and adults in the other. Alternatively, you could use one room for just luggage. No matter how you plan on using an 8 person tent, it is sure to provide you with more comfort and convenience. Below we have made a list of the top 5 tents based on 8 person tent reviews. Coming in at number one for the best eight person tent is the Coleman Red Canyon Tent. 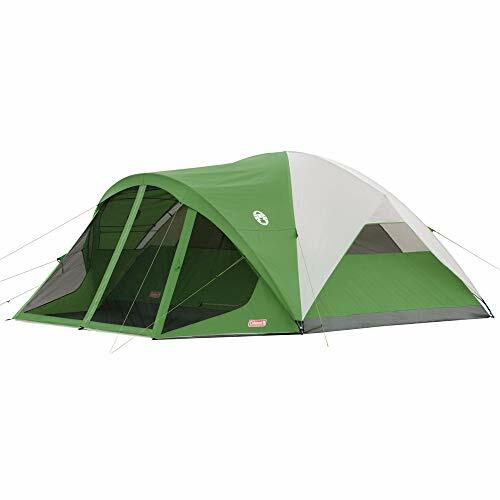 One great thing about this tent is that it comes with room dividers so that you can divide the tent into 3 separate rooms. 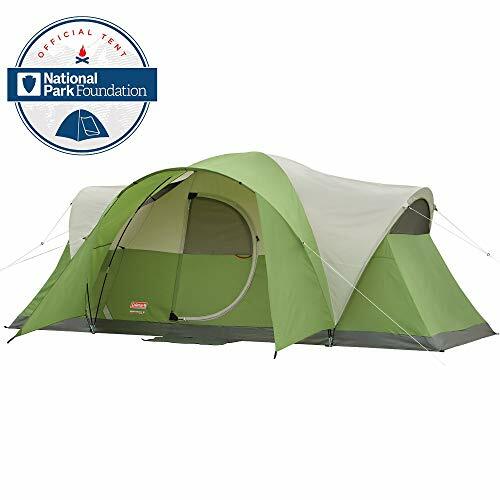 You are guaranteed to stay dry inside this tent since it is equipped with Coleman’s WeatherTec system. It offers 170 square feet of room inside, ensuring that there is enough space for everyone. There are 2 large windows and a vented Cool-Air access port to provide excellent ventilation. The 2 sidewall pockets allow you to conveniently store your gear. Continuous pole sleeves, the pin and ring design, and Insta-Clip attachments make setup a breeze. 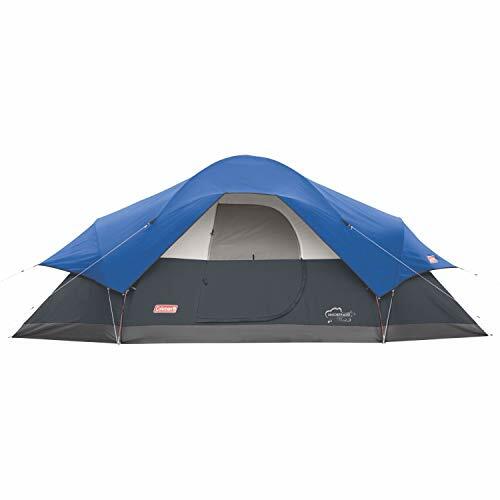 Setting up a tent couldn’t be easier or faster than with this Coleman instant tent. The poles come pre-attached so all you have to do is unfold the tent, extend the poles, and lock them into place. Setup will only take 1-minute. The room divider will divide the tent into 2 rooms if you choose to use it. Fitted with Coleman’s WeatherTec system, you are sure to stay dry in rainy conditions. The fabric is twice as thick as traditional tent fabric and is waterproof. 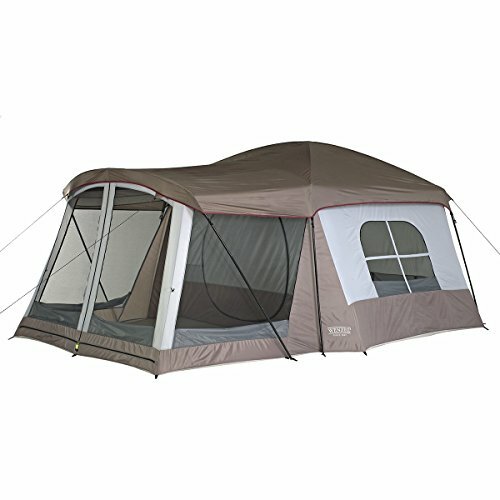 With 2 doors, it is easy to share this tent with several others. There are 7 windows to provide excellent ventilation. This tent has a cabin design and offers more interior space. The windows are angled to ensure that the rain stays out even when they are open. The hinged door is convenient and easy to use- no need to unzip and zip the door when entering or exiting the tent. The rainfly extends over the entryway, forming an awning. This provides more protection from sun and rain. 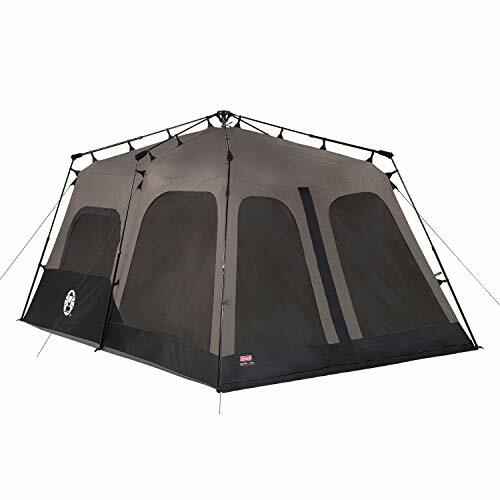 The mesh roof allows for more sunlight inside the tent and it is also great to use for star gazing at nighttime. There is an electrical access port so that you can bring your appliances inside the tent. With an easy setup process, you can pitch this tent in just 15-minutes. One of the best things about this tent is that is has a screened in porch. The porch is a nice area to lounge, and you won’t have to worry about being bothered by bugs if you zip the screened closed. The Insta-Clip™ pole attachments enable the tent to withstand strong winds. The welded floors and inverted seams ensure that no water leaks into the tent. The snag-free continuous pole sleeves help reduce setup time to just 15-minutes. Attach the rainfly for weather protection, or leave it off to star gaze through the mesh roof at nighttime. The interior is spacious and can fit 2 queen-sized air mattresses with room to spare. This tent has an attached screened sunroom that can be used as a lounging area or play area for children. It can also be used as a second bedroom. You can leave the rainfly off in nice weather to enjoy the mesh roof which offers great ventilation. At nighttime, you will get a great view of the stars.The large windows in the main tent area provide extra ventilation and help you keep cool on hot summer days. The double-staked “power corners” increase the tents stability so that it can hold up in windy conditions. Designed to be weather-resistant, this tent will keep you dry in the rain. If you are in the market to buy an eight-person tent, you want to make sure it is good quality. Eight person tents aren’t exactly cheap, so you want to make sure you will get your money’s worth. When you finally settle on a tent, you won’t regret spending a little extra to get a good quality one. Getting a good tent will make your camping trips more enjoyable for the whole family. You will get many fun camping trips out of a good tent.